The continuous “Ribbon of Light” that illuminates over two miles of Van Ness Avenue from Market Street to Bay Street faces imminent destruction by SFMTA. Built by the Works Progress Administration (WPA) in 1936 for the inauguration of the Golden Gate Bridge, and installed atop Beaux Arts trolley poles dating from before the 1915 Panama Pacific International Exposition, these graceful geographic and historic markers are slated for replacement by anonymous steel-tube urban lamps as part of the incoming Bus Rapid Transit (BRT) project. In an effort to preserve the Beaux Arts history of San Francisco, a group of civic leaders, neighborhood associations, and preservationists, including San Francisco Beautiful, San Francisco Heritage, and the Victorian Alliance of San Francisco, have formed the “Coalition to Save the Historic Streetlamps of Van Ness Avenue”. Our goal is simple: to ensure that the city recognize the streetlamps’ civic and historic value, and fully explore the costs and technical feasibility of reuse and/or replication of the Van Ness Avenue Historic Streetlamps, before discarding them. We believe that the streetlamps’ classic design can and should continue to provide the architectural framework for new development along Van Ness as a celebration of civic pride, uniting old and new San Francisco. The Van Ness Avenue streetlamps are the third and last of the classic streetlight designs in San Francisco, after the Path of Gold Light Standards and the Golden Triangle Light Standards (both protected as San Francisco City Landmarks). Although degraded over time by neglect, insensitive retrofits, and layers of tacked-on signage, the elegant teardrop-shaped pendant lights and graceful brackets endure as the only consistent hallmark of Van Ness Avenue’s varied streetscape, providing visual continuity beyond the Civic Center and throughout the two-mile corridor. The scythe-like design of the replacement lights is a jarring contrast to the graceful Beaux Arts originals. The process, and end result, betrays the public trust. While recognizing the streetlamps’ “unique” contribution to the Van Ness corridor, the EIR failed to evaluate a single option that would have preserved the historic streetlamps or any component thereof. The feasibility of reusing the cast iron light standards and bases with compatible replacement poles was not addressed, nor was the possibility of retaining the original streetlamps as a historic counterpoint to contemporary support poles. Notwithstanding this glaring omission, the EIR includes repeated assurances that the replacement design would “retain the architectural style of the original support pole/streetlight network,” accompanied by visual simulations showing how the historic look and feel could be faithfully replicated. The austerity and anonymity of the current design is a profound departure from what was promised in the EIR. Many of San Francisco’s most thriving streetscapes have been enlivened by the introduction of new, but historic-inspired streetlights, including the Embarcadero, Dolores Street, Divisadero, Octavia Boulevard, and Castro Street. That SFMTA would consider wholesale replacement of one of the three remaining networks of classic streetlamps in San Francisco, and the only unifying and defining element of Van Ness Avenue, is inexplicable. Even at this late date, however, there are some encouraging signs. 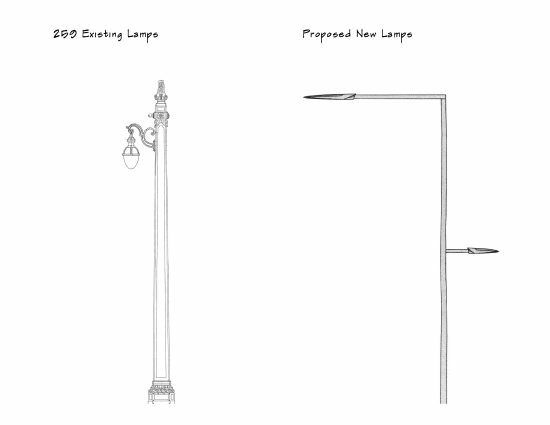 SFMTA is currently developing a treatment plan for retention as well as replication of four of the historic trolley poles, lamps, and brackets situated within the Civic Center National Historic Landmark District, suggesting that a similar approach could be applied to save Van Ness’ historic streetlamps outside the Civic Center. In response to concerns raised by the coalition and others, the agency has commissioned a reassessment of whether reusing existing components on new poles is feasible, with consideration of project standards and specifications, that is due to be completed at the end of September. 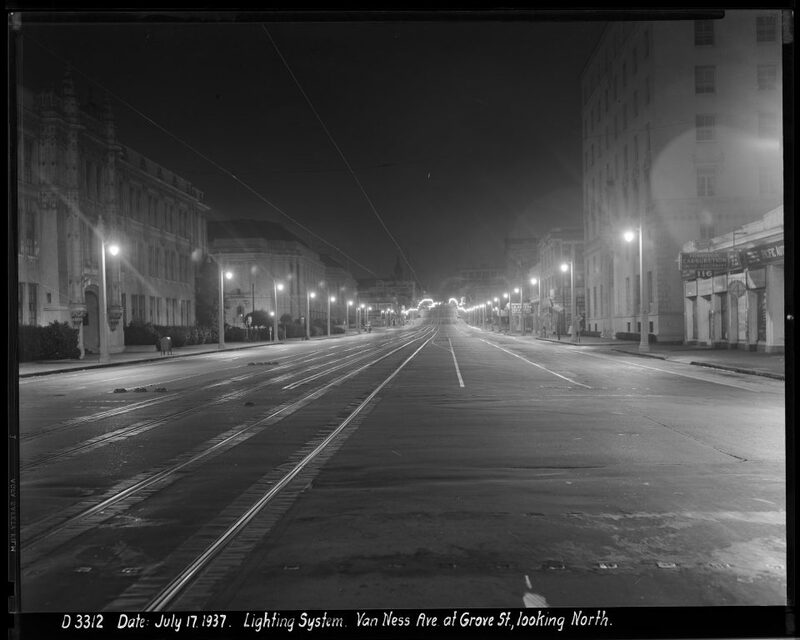 Just last week, with broad public support, Supervisor Aaron Peskin introduced a resolution to the San Francisco Board of Supervisors urging the reuse or replication of the Van Ness Avenue Historic Streetlamps, due for approval at the Board’s September 20 meeting. The fate of the Van Ness Avenue Historic Streetlamps is a metaphor for a common dilemma faced in a city confronted by rapid and inexorable change: Do we preserve and perpetuate our cultural markers or discard them in favor of progress, modernity, and expediency? Fortunately, it is a false choice. Indeed, San Francisco is a palimpsest constantly reinventing itself, but also with an abiding respect and awe for the past. 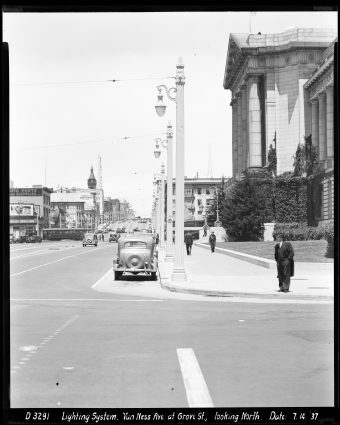 The Van Ness Streetlamps is only the latest challenge and opportunity to renew the city’s past as a part of its future.